He Says: Unfortunately, we sometimes have to book things in advance even though we don’t want to. Either we find a good deal or we just want to make sure something isn’t full by the time we get there. 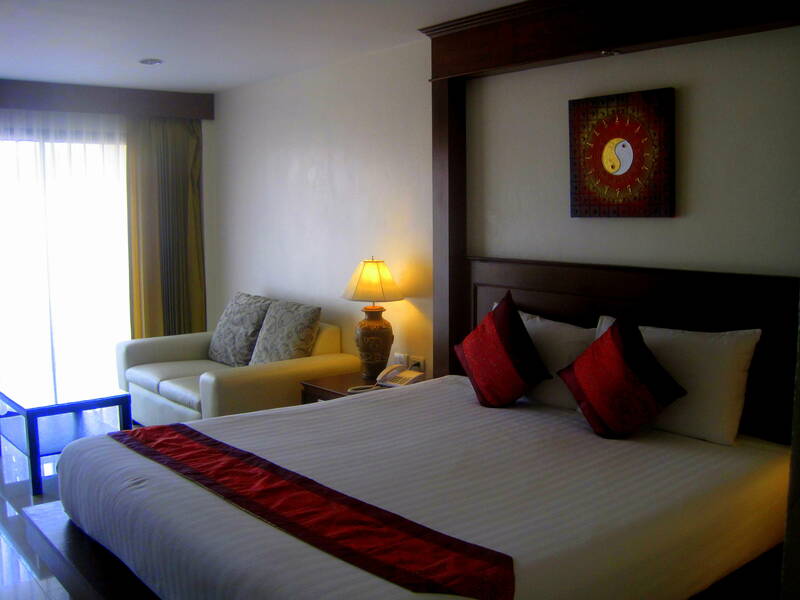 In the case of Phuket, we found and booked a good deal on LivingSocial several months ago. I think we pretty much forgot about it until we got to Thailand and started hearing about what a party scene it is. 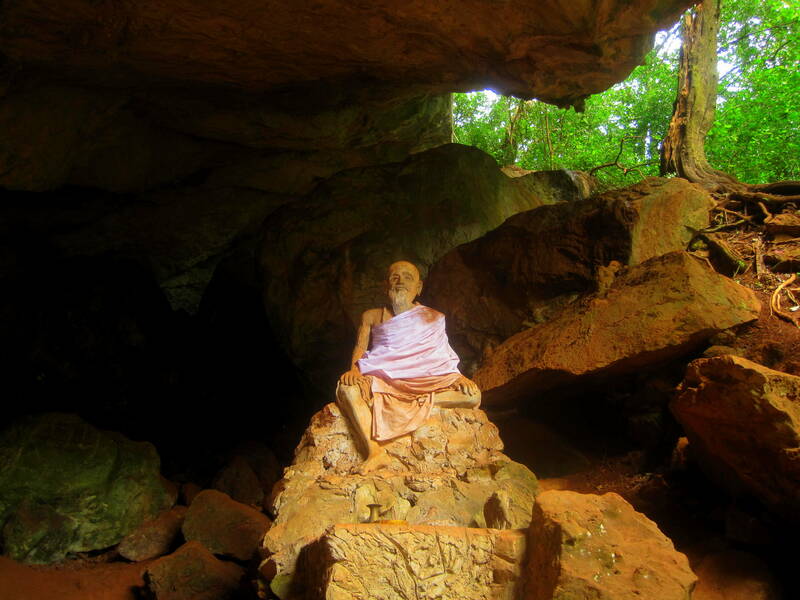 After relaxing in Koh Lanta we weren’t really sure what to expect. 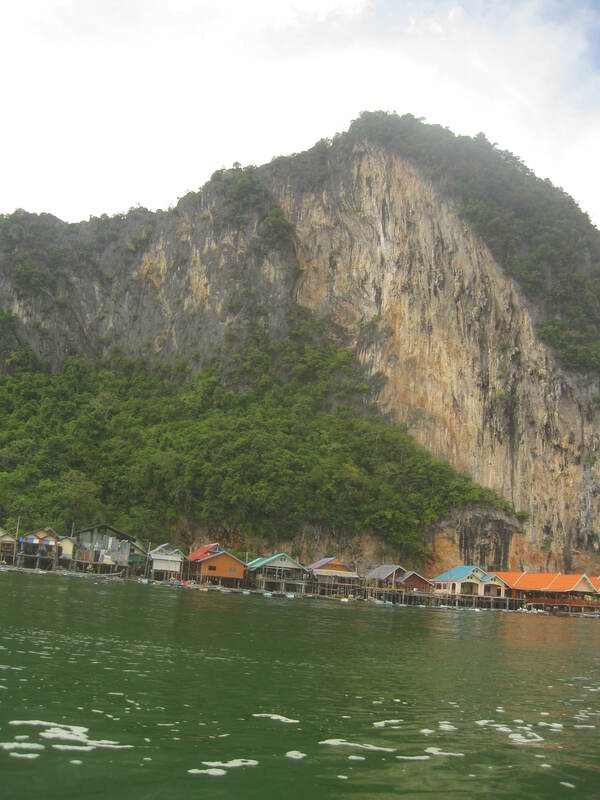 I’m glad we didn’t stop there because Phuket was everything we had heard and more. 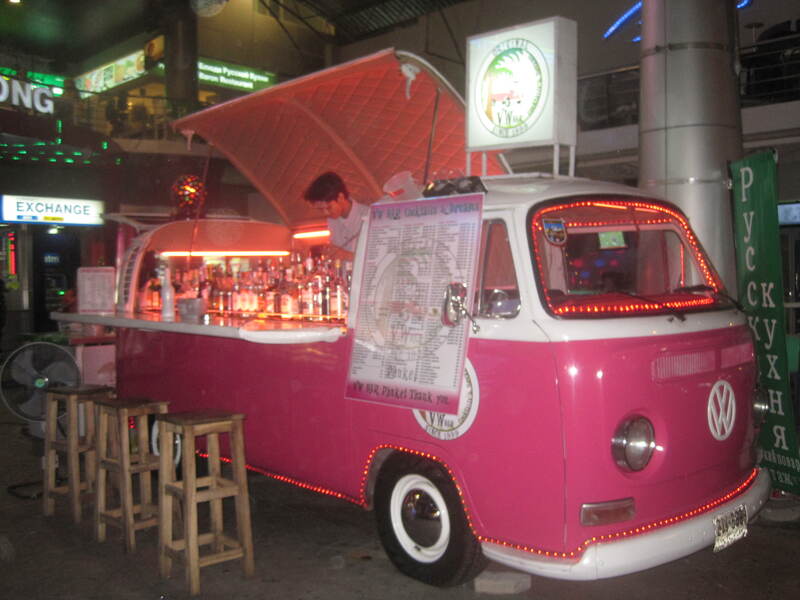 If you can imagine a version of New Orleans with a little bit of Vegas on steroids, then you can imagine Phuket. Like New Orleans, Phuket has an entire district consisting of bars, restaurants and markets, only here there’s no French colonial architecture. 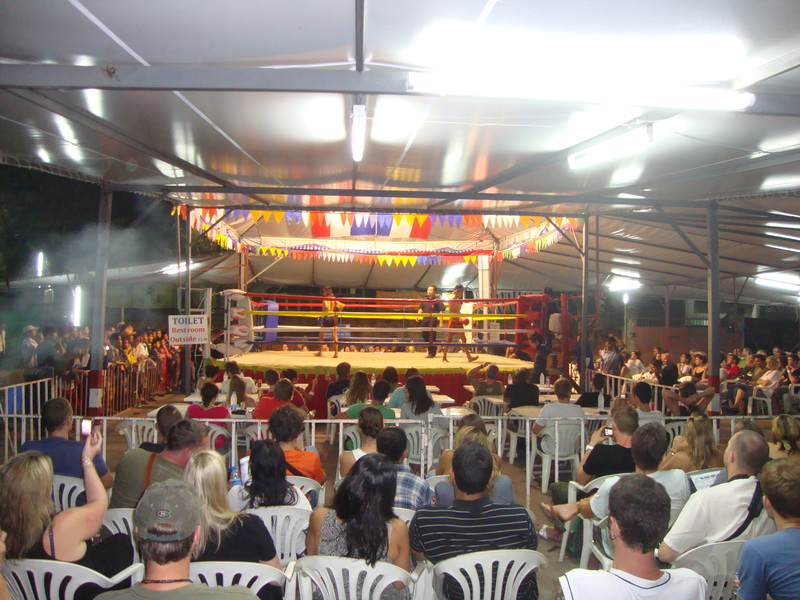 Instead, there’s establishments built out of huge plastic jungles, lions and Muay Thai boxers. Basically, they looked like amusement park rides. Some of streets are lined for a quarter mile with nothing but seedy bars and massage parlors. The bars were open all day but the fun didn’t start until night when the lady-boys came out. I have to admit we enjoyed watching them sing and dance at the karaoke bar. 🙂 Some of our entertainment consisted of trying to figure out who was a lady-boy and who wasn’t. I’m serious. It was that hard to tell sometimes. Like Vegas, prostitution is legal here but it’s a lot more conspicuous. The girls hang around the bars waiting for their catch, and middle-aged men are walking around everywhere holding hands with their honeys. “No Money, No Honey” is the standard catch-phrase you’ll find on all the t-shirts in the markets. 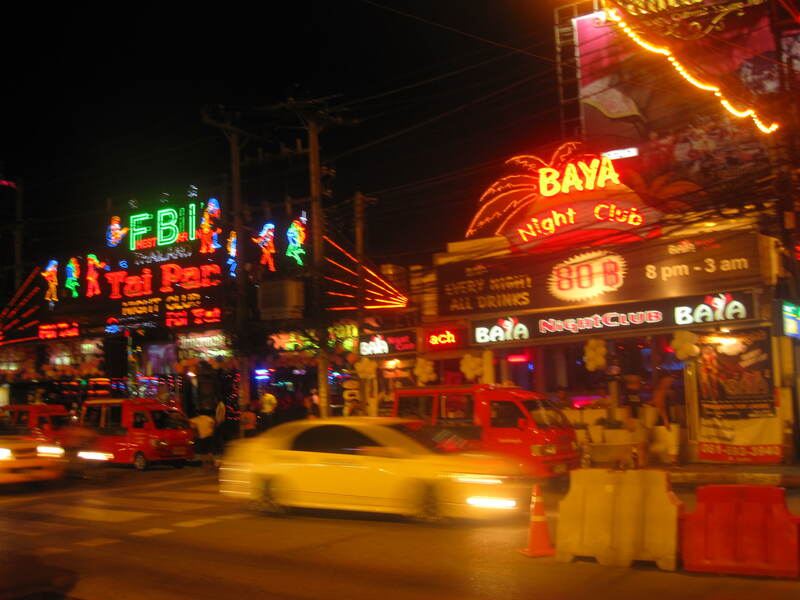 That the industry is so big in Phuket is most likely due to the Russian and Thai mafias running the area…or so we hear. It was actually pretty sad to see. Though Phuket wasn’t exactly our scene, we still had a good time and enjoyed ourselves. When we weren’t bumming around our plush accommodations (which was most of the time) we were drinking mojitos out of buckets, getting free shots of tequila and watching good live music. We saw one band with a Thai guitarist who slightly resembled Slash and played a lot of Journey songs. The bucket of mojito encouraged us to sing along. 🙂 We did another island tour but by this point we were getting pretty burnt out on the beaches. 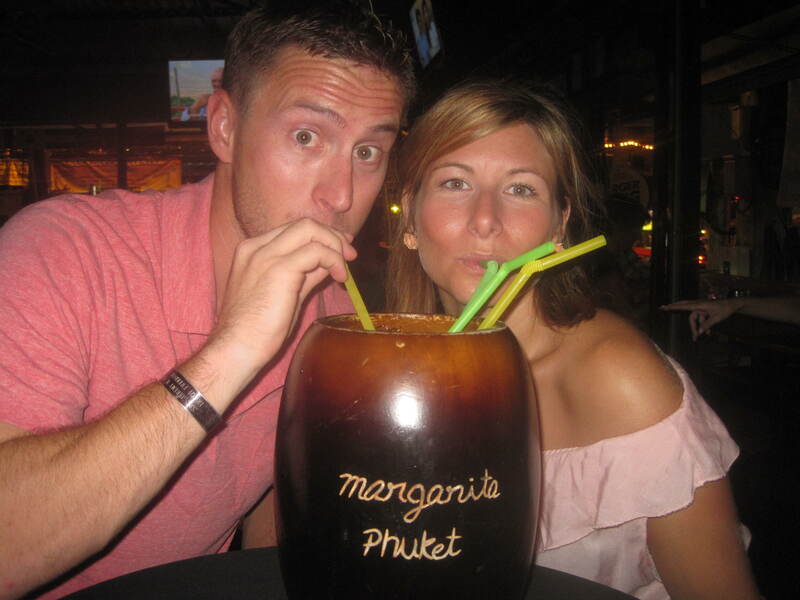 Standard drink size in Phuket. We walked through a few markets but once you’ve seen one you’ve seen them all. Sunglasses, suits, watches, t-shirts and harem pants. The markets in Phuket were more like gauntlets so after a few days we tried to avoid them altogether. Sometimes we couldn’t avoid them so we practiced the “Walk fast, Look straight ahead” technique. There was no need to hang out in Phuket past our reservation so we caught a flight to our next stop, Chiang Mai. It was nice to get away from the thumping club music and pushy salesmen in the markets. We still heard the occasional “You want massaaaaggge?” and “My friend, I make you berry good suit”, but they weren’t nearly as frequent as in Phuket. The temperature was slightly cooler and drier which was a huge relief. There was a little hustle and bustle but it still felt a lot more laid back. 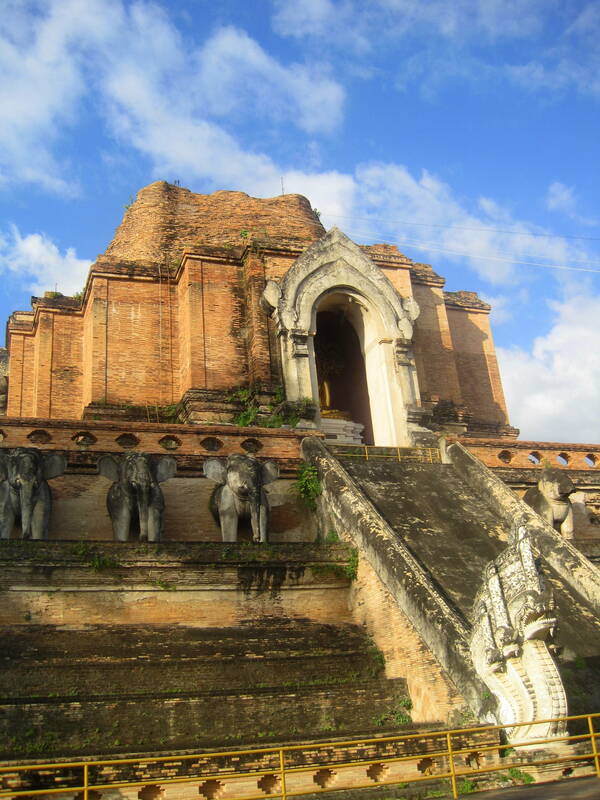 Instead of being a party town it was just a regular city….with a lot of monks and temples. She Says: Yes Phuket…pretty much a spring break type of vibe with the addition of old fat guys with 15 year old, pretty Thai girls. Apparently they have no shame because they are sporting these girls all over town without a care in the world. We went out one night and got a little tipsy but other than that we mostly relaxed in our nice 4 star hotel. We didn’t even go to the beach 1 day..
We did however do another island tour. 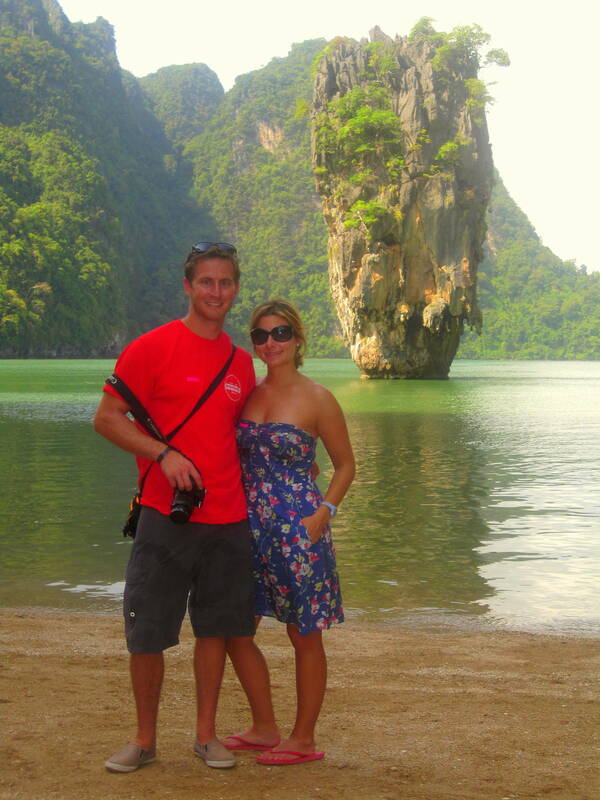 We visited James Bond Island, did some kayaking, and visited a floating village. It wasn’t nearly as good as our first island tour but it was a good day out and about. Chiang Mai was bigger than what I expected. Apparently it is the 2nd largest city in Thailand next to Bangkok. We did some touristy stuff . One day we went and saw an elephant show, rode an elephant, went on an ox cart ride, and floated down the river on a bamboo float. On another day we went and watched monkeys dunk basketballs, ride bikes, and do other various tricks. 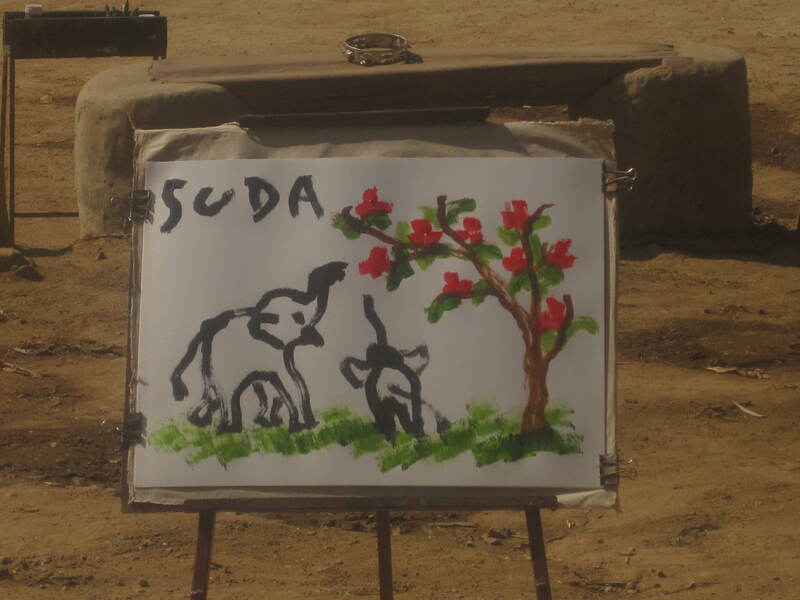 We also went and watched snake charmers–I hate snakes and that stuff is crazy! There was a large king cobra that was in a cage and did not like J at all! He would follow him around the cage and hiss at him. When he stood up the snake was at least 6ft tall and even though a cage separated them, when the snake struck at J, J swayed back, lost his footing and almost fell–haha it was hilarious! Good thing the snake was in a cage otherwise J would have been lunch. 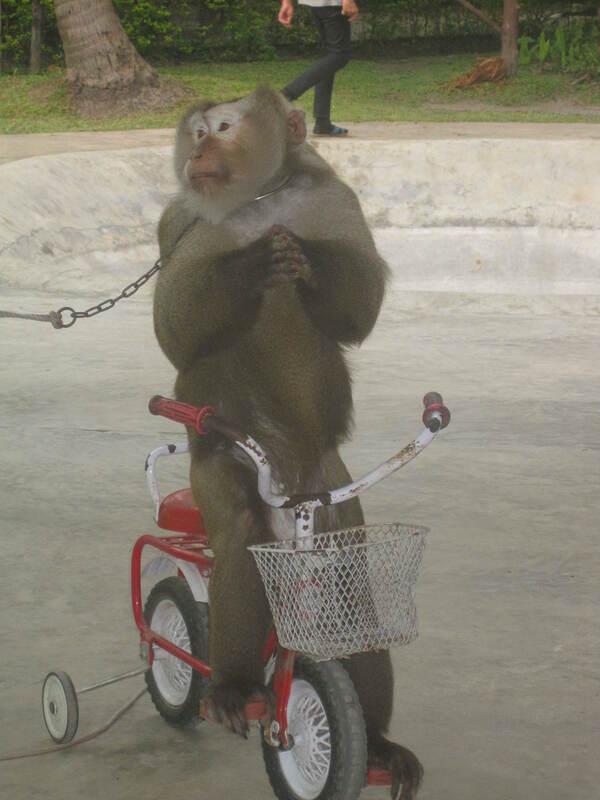 Monkey on a bike. 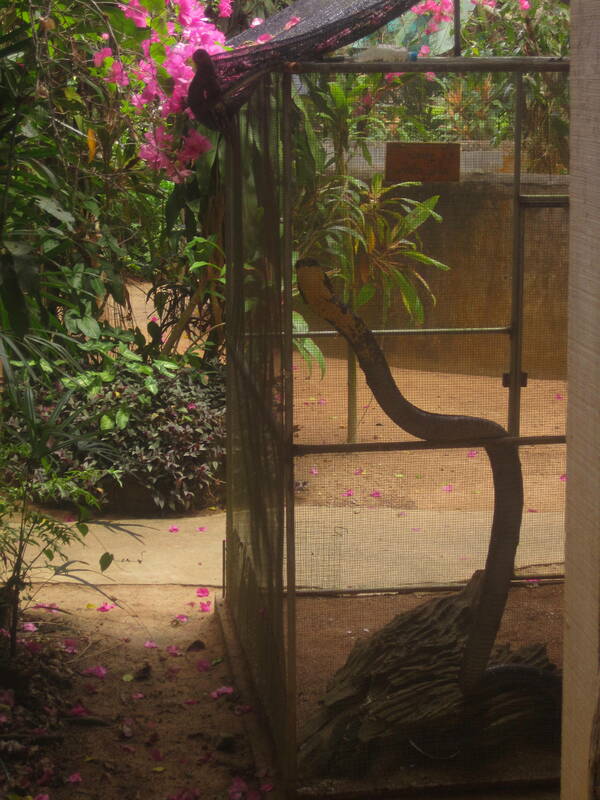 It's so unusual to see them doing human things- makes ya wonder..
King Cobra that wanted J for lunch! Her final product! Impressive I would say. 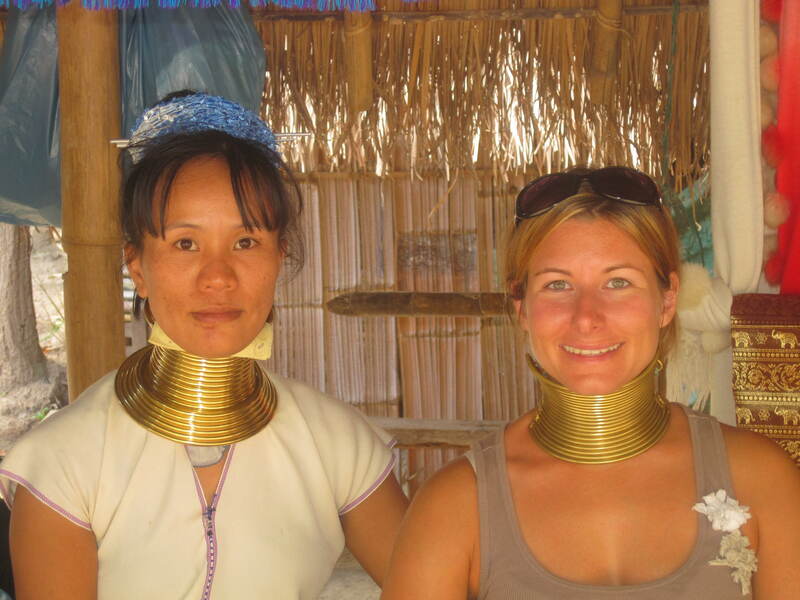 On our ride back from the snake charmers we stopped at a Karen Longneck Village. This is one of those villages where the locals hook brass rings around their necks starting at a young age. Each year they add a new ring so after a few years their necks begin to elongate. Most of these hill-tribes are refugees who’ve fled from Burma. The Thai government allows them to live off the land and, for the most part, leaves them alone. It’s not a good life but it sounds like it’s better than what it would be in Burma. Unfortunately, the village we went to wasn’t very authentic. I’m sure the locals were refugees from Burma but it seemed like they strapped on their rings right before we arrived and put on a little show. It actually wasn’t really a village at all. More like a market where they sold us crafts they “made themselves”. We weren’t really sure whether or not it was a good thing to buy stuff from them. It was hard to tell if the money actually helped them, or if it perpetuated their lifestyle. 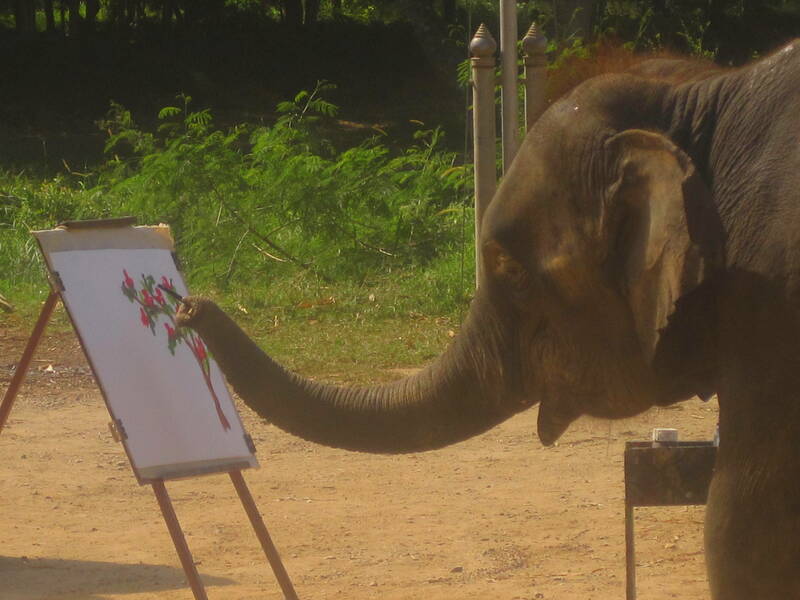 In a way, it was kind of like watching the monkey and elephant shows. I thought I would give it a go. Those rings are HEAVY! We also visited a lot of temples. We were there almost a week and probably still didn’t see half of them! One temple was very old and almost looked like Roman ruins. It was beautiful and nearby so J and I visited it a couple of times. 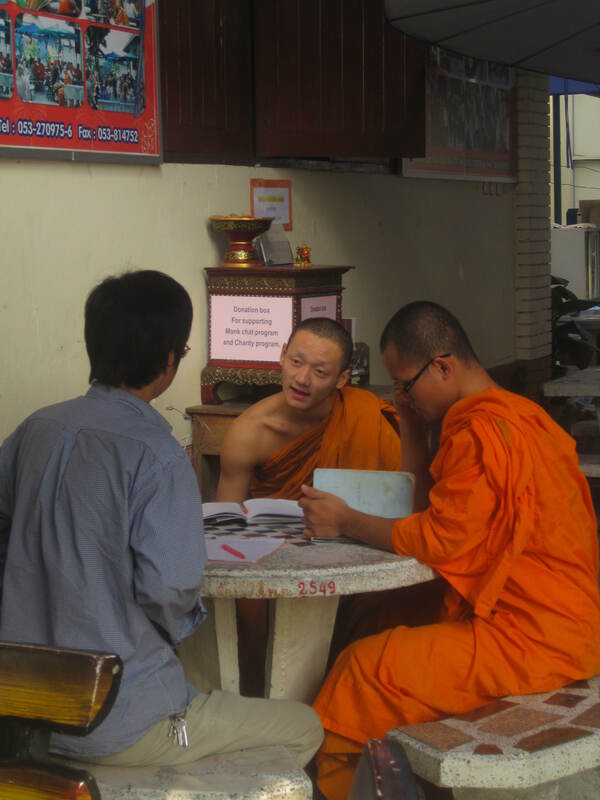 One of those times we met with a couple of monks and did a “monk chat”. This is where a couple of monks agree to meet with you so they can answer any questions you may have about their religion and lifestyle. Likewise they can ask you questions. It was awesome and very informative. I did find it quite funny that their first question to us was, “Do you like Obama”? and following that “Do you like Bush”? It made for some interesting conversation. The monks definitely live a simple life and seem content with it all. There is something to admire in that. They are not allowed to eat anything after 11am everyday. Talk about will power! J and I really enjoyed the opportunity to sit with them and learn about their life, culture, and beliefs. The monks we chatted with. Chiang Mai was nice but a little too big city for me. Off to the hills of Pai, Thailand we go! 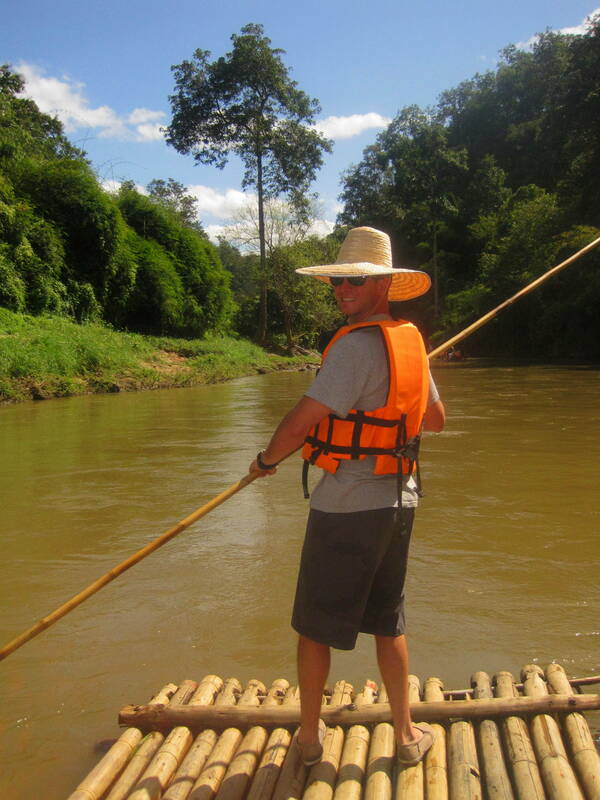 I have a question.. Did you do the excursions in chiang mai (karen longnecks, bamboorafting, elephant camp) on your own or did you do it with a group? We would like to do it on our own of with a local guide but have no idea where to start..
We did everything in a group tour. If you can find a local guide, I would recommend doing that. We had a good time but felt a little rushed and it was definitely “touristy”. Also, if you can avoid the long-neck village you should. It was more of a market rather than a village and I’m pretty sure the Karens put their brass rings around their necks right before we walked in. Not very authentic. If you want some real hill-tribe villages you should do some trekking in Pai, a few hours north of Chiang Mai.